It was a great day in Indianapolis. I’m here for the official announcement that this will be the hub city for the 2010 Millard Fuller Legacy Build, and what an event that will be. The plan is to build 10 new houses and rehabilitate 20 more, all to be dedicated during the week of Sept. 6. All of the new houses and 10 of the rehabs will be done during the Legacy Build week, and the remaining 10 rehabs worked on in the weeks before. 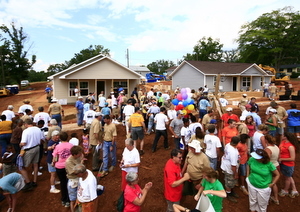 Another 70 houses will be built and rehabbed around the world for dedication during the Legacy week, although with so many going up in Indy I’m wondering if we shouldn’t bump up the worldwide numbers. There were some real concerns about whether or not Indianapolis could serve as the hub city due to the difficulty they were having locating 10 building lots that were close enough together. Then a couple of weeks ago Jeff Cardwell, one of the key folks in the Indy Fuller Center and member of the Fuller Center’s international Board of Directors, got a call from Mark Stewart, president of Southeast Neighborhood Development. Turns out that SEND had received a neighborhood revitalization grant that allowed them to buy derelict houses, raze them and prepare the sites for new construction. The terms of the grant didn’t allow them to build new houses on the sites, though, so they were looking for a partner organization. Talk about a marriage made in heaven! To add a little frosting to the cake the properties they were buying are on St. Paul St., St Peter St., and Churchman Avenue. You don’t have to have your spiritual antennae extended too far to recognize this as Providential intervention! The partnership with SEND will allow the Fuller Center for Housing of Central Indiana to build more than 10 houses in a neighborhood that is anxious for revitalization. The announcement of Indianapolis’ selection as the hub city was made in a press conference that was well attended by the local media. As I write this I’m listening to a story about the announcement on the channel 13. I got a chance to speak about The Fuller Center’s international work and FCHCI president Chuck Vogt invited the community to join in the project. Mayor Greg Ballard spoke about the importance of this effort in revitalizing the neighborhood and SEND president shared about their work in the area. Christ Church Apostolic led us in singing Building on Higher Ground and, as we ended the event with a walk through neighborhood, led us in Marching to Zion. Millard would have loved it! The weather forecast called for rain, and it was looking a little ominous as we got things underway. I figured that with Peter, Paul and Millard all smiling down on us we should be able to get things done before the rain fell. And we did. As we rounded the last corner on our stroll through the neighborhood we felt the first drops of moisture, and it’s been damp out ever since. There were a number of neighborhood residents at the press conference, many from a local group they started as ICAN and is now called WECAN. This group started on Churchman to clean up their street and get rid of the crime. They called themselves Indianapolis Churchman Avenue Neighbors and had great success, so much so that folks on St. Peter and St. Paul wanted to join, so they expanded to West and East of Churchman Avenue Neighbors—WECAN—and continue their efforts at making their neighborhood a better place to live. The good work of the Fuller Center will certainly advance their efforts as new and renovated owner occupied homes replace the abandoned and derelict houses that mar the landscape and invite crime. It’s a great day for Indianapolis. Be sure to stay updated on the 2010 Legacy Build here!